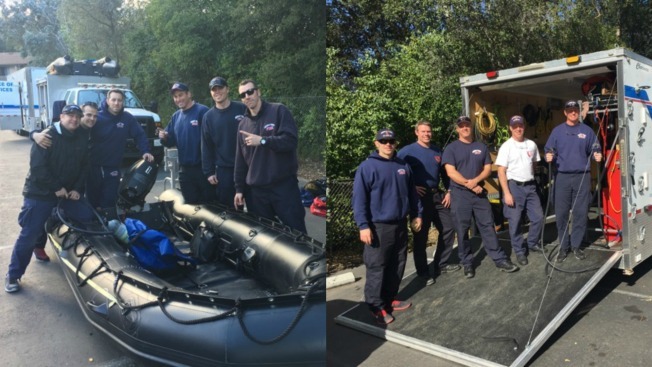 A Menlo Park-based swift water rescue team returned home on Friday following a deployment first to Sacramento and then to Los Gatos in case the recent rainstorms threatened people's lives, Menlo Park Fire Protection District officials said Saturday. The team, which is made up of staff members of the fire protection district, was deployed Sunday after returning from Oroville the week before where a damaged auxiliary spillway threatened nearly 200,000 people. The rescue team from Menlo Park is one of the state's original swift water rescue teams established in 1994. Its staff is a mix of new and veteran members, including some who responded to disasters such as Hurricane Katrina. The team was ready to respond to San Jose if the city needed help, but that wasn't the case. Menlo Park fire Chief Harold Schapelhouman said the team will be ready should melting snow cause flooding and threaten people's lives later this year.